Mars Painting has been caring for cedar siding for over 27 years. 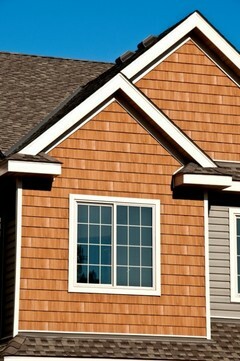 Cedar siding gives a beautiful, natural look to any home. A beautiful finish on your cedar siding offers a warm welcome to visitors and family. However, neglected cedar has the opposite effect. If your home needs a siding facelift, give Mars Painting a call. We offer free quotes and reasonable pricing. There are a multitude of stain options for cedar exteriors. First, the staining professionals at Mars Painting will be happy to show your available options. You'll want to decide the level of transparency you'd like in the staining product. Some are more solid and have the look of paint while others are more opaque. In general, the opaque stains will give allow more of the natural wood grain to come through. All of our cedar stain products will provide maximum durability and a beautiful finish. Give us a call for a free cedar siding staining quote today at (224) 358-3538. Every cedar siding stain job begins with a careful analysis of the shape of the wood and your personal preferences. Do you have some rotting wood? The staining professionals at Mars Painting are skilled in removing and replacing any cedar boards that cannot be repaired. We'll find new boards that match and blend with your existing siding to save you money and give you a smooth, consistent finish.